A decadent painter in both concept and form, Pia Fries takes her interest in a 17th century female naturalist and turns it into lush, contemporary work with a hidden narrative element. Maria Sibylla Merian made watercolor observations of plant and animal life in South Africa in the late 1600s, and Fries has taken elements of Merian’s work and collaged them into a skeletal framework for her sumptuous abstractions. 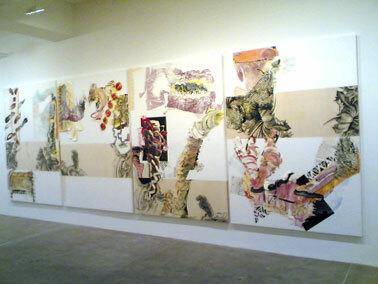 Heavy globs and streaks of paint obstruct and frame the representations of flora and fauna, looking as much like magnified elements of nature as the detailed partial renderings. The visual beauty of the work is undeniable, and the historical narrative is one that lingers long after the images have dissolved in memory. The exhibition closes tomorrow.